Men are from Mars and Women are from Venus by John Gray. In this blog I will be writing a review about this book and the reason it is such a great book about listening. As a Realtor in Idaho Falls for The Group Real Estate I work with both men and women everyday. It is a big part of my job to listen to them and their needs and wants. If I am listing a home for someone then I need to listen to the desired amount that that person needs to get for the home before we can even put it on the market. If I am helping a buyer try and find a home then I need to listen to what their needs and wants are as far as the details of the house go. In the book men are from mars and women are from Venus it talks a great deal about listening. Men are naturally problem solvers and while they might listen to a women talk about what is going on that day they are subconsciously listening for problems and then when they respond they are trying to fix said problems. This can be a problem because sometimes a woman just wants to vent and not have any problems fixed. Resulting in a feeling that the two people might as well be from different planets because their communication is lacking. Relationship advice for men can come in many forms, but the wisdom that you’ve got from others might not be serving you well. Men Are From Mars, Women Are From Venus by John Gray will forever change the way that men and women view each other. If you’ve ever felt like your intimate partner is from another planet — you’re not alone. On a daily basis, most men feel like their girlfriend or wife is from another planet, and women feel the same way about their men. When you’re finished reading the book, you’ll probably still feel like we’re both from different planets, but you’ll walk away with incredible enlightenment, and the new perspective will help you improve an existing relationship or one that you might have in the future. Relationship advice for men, women and couples really can be as simple as gaining an understanding of the other person. If you think your relationship is as good as it gets, then you haven’t read this book. I believe Men are From Mars, Women are From Venus serves as a powerful manual that every man should own, and it’s just as useful for women and couples. Honestly, even teenagers can benefit from the advice in this book, and I wish someone had told me to start reading books like this when I was younger. men are like rubber bands and women are like waves. Men can only stretch so far before they will snap back. Men deal with stress by retreating to a cave, or a place that makes them comfortable. Women are like waves that there is a rise that peaks when their needs are met making them feel supported and not alone. They do not need caves they find stress released in relationships talking to a friend or loved one about their problems. In conclusion I would say that communication is key. Listening to each other and talking about what the other person needs will help people feel like they are more from the same planet Earth. This particularly helps during my interactions with clients. 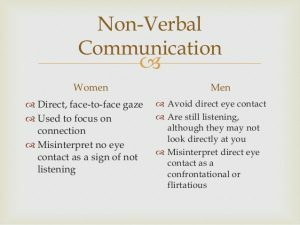 I know that I need to treat men and women differently when it comes to listening. Women will keep score on how many times I have showed them that I care. It doesn’t matter how big the event was that I did or did not do it is wither I did it or not. Men are different in that It does matter how big the event was. 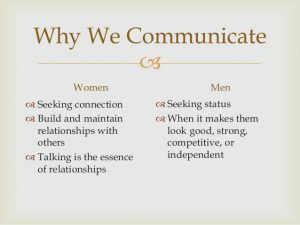 Reading people and communication are the key elements to the relationship. I must learn to first listen then act accordingly to whom I am listening to.